Travel experts and casual holiday-makers all tend to agree that the Caribbean is one of the world's premier vacation destinations, especially for people who want that unbeatable combination of sun, sea, and sand. The Caribbean Sea is filled with islands and nations, each boasting their own unique cultures, cuisines, historical locations, and beautiful natural landmarks. This is why planning a trip to the Caribbean can be so difficult, as there are simply so many mind-blowing places to choose from. If you're looking to enjoy a dream Caribbean vacation, Puerto Rico needs to be one of the destinations you consider. This territory of the United States is found in the northeastern part of the Caribbean Sea, around 1,000 miles away from the Floridian coastline. Puerto Rico, which translates to 'Rich Port' in English, is an incredible place to visit. There's a lot of history to this island and many stories to hear from the locals, who are known for being very friendly to new faces and visitors from all around the world. Puerto Rico is known for its unique Mediterranean-inspired cuisine, lively music, colorful architecture, and world class beaches. You can experience all these aspects of Puerto Rican life in the Commonwealth's capital city of San Juan, which is located on the northern shore of the island. There are plenty of beautiful beaches all around Puerto Rico, but you don’t need to go far from San Juan to find some of the very best locations. The city is a thriving, lively hub of activity, filled with stores, eateries, hotels, bars, and fascinating historic locations, so it’s the perfect place to base yourself for a Puerto Rican beach vacation. In order to help you find the best beaches around San Juan, take a look at our beach guide below. Beloved by locals, who usually simply refer to this place as 'Ocean', Ocean Park Beach is best-suited for active people who are interested in water sports and physical activities down on the shore. A lot of different sports and fun things can be tried out at this San Juan beach location, and it's not uncommon to see groups of people playing volleyball or soccer on the sand, with more adventurous folks out on the water enjoying some jet skiing or windsurfing. There's a real lively atmosphere at Ocean Park Beach and a lot of great amenities right nearby too like hotels, eateries, bars, and stores. Also known simply as Ecambron Beach, this part of the Puerto Rican coastline is found not far from Old San Juan and is a good place to base yourself if you're looking to explore the nearby historic areas. El Escambron is a fantastic spot to do some snorkeling, scuba diving, and swimming, and the sands here are nice and comfortable for a lazy afternoon of sunbathing as well. It's easily accessible from the downtown parts of San Juan, so it's one of the first beaches many tourists choose to visit. The Condado area of San Juan is generally regarded as one of the more upscale, luxurious districts of the Puerto Rican capital. Lots of 5-star resorts and deluxe hotels can be found in this area, and guests lucky enough to stay here will have easy access to Playa Condado, which is easily one of the prettiest beaches in all of Puerto Rico. This beach boasts some fantastic views of both the ocean and city of San Juan itself. Playa Condado is a super spot to relax with family or friends, or simply lay back and soak up the sun's rays. Sunbathers line the sands every day here, but the waters can be great for swimming too due to the calm nature of the waves on this part of the Puerto Rican coastline. We just spoke about Playa Condado, but La Playita del Condado is a distinctly separate location, despite being situated right by the main beach. 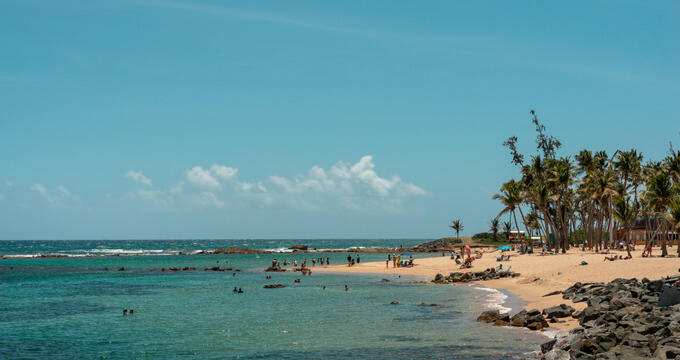 The 'playita' part of this location's name translates to 'little beach' in English, and La Playita del Condado is therefore a very small section of sand which is highly suited to families with young children. The waters here are exceptionally calm and crystal clear, offering just the right conditions for even the youngest visitors to do some paddling and splashing around without any danger. Lots of families tend to gather here, creating a nice, friendly atmosphere where everyone feels welcome. Located in Old San Juan, Playa Peña is another of the best Puerto Rican beaches, but not too many people actually know about this one. A lot of tourists in San Juan tend to congregate in areas like Playa Condado or Ocean Park Beach, so Playa Peña is a much calmer and more tranquil location, free of the noise and crowds that dominate large parts of the city's main beaches. You'll see a few locals and maybe a couple of regular tourists in the area each day, but it never gets too busy at Playa Peña despite the fact that this is a gorgeous little beach with some lovely views. It's ideal for a romantic stroll with your loved one and there are some old historic ruins right nearby for adventurers to explore.